On February 8th, I noticed that male Red-winged Blackbirds had moved into the cattails and begun to set up territories. I watched one male display repeatedly from the top the brown seed-head. It would puff out its wings to show the red epaulets, lean forward, and give its territorial song. This male was in a patch of cattails along the west side of Green Lake. A large willow tree separated this patch from a similar patch down the shoreline and the second patch had a second male calling away. When the second male flew from its set of cattails to the willow, the male I was watching moved onto a large willow branch where it increased its intensity of displaying and calling. The willow tree seemed to be the boundary between the territories for each of these males. After a few minutes of vigorous displaying, the two males returned to their respective cattail patch. On the March 15th, the two males were still vigorously displaying. I did not see a single female in or around the cattail patches. It will be interesting to see when they move in and start to build nests. Owning one of these patches is critical to successfully breeding and seeing these males vigorously defend them for several months before females arrive shows how important this is. 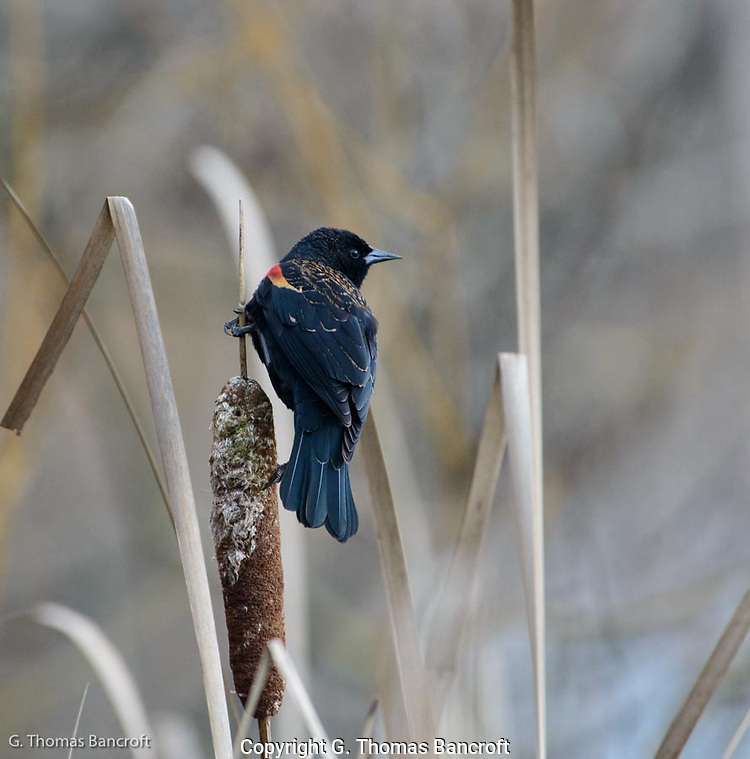 Next time you walk along the west side of Green Lake check out the cattail patches to see if you can spot male or female Red-winged Blackbirds. They are a wonderful sight to see. PS: The Spring Best of Northwest 2013 Art Show is this weekend, March 23 and 24th, at the Smith Cove Cruise Terminal on Pier 91 next to the Magnolia Bridge, 2001 West Garfield St, Seattle. I will be there showing some of my photographs. Come on down to enjoy the artwork, music, wine and beer. More than 140 artists will be present. I had the opportunity to go to the Galapagos Islands last April. It was a marvelous trip and if you every have a chance, I highly recommend you go. These islands were made famous by Darwin’s work on evolution because of all the unique species on the islands and how closely related species vary between individual islands. One of the remarkable species we saw was the Sally Lightfoot Crabs (Grapsus grapsus). These crabs are brightly colored with red above and blue below. You can spot them from several hundred yards and generally they will stay put until you approach within a few yards. They get their name because they run really quickly across short stretches of water and people thought they could stay on the top of the water. These crabs feed on algae and detritus. They move back and forth with the tide, always staying really close to the water. 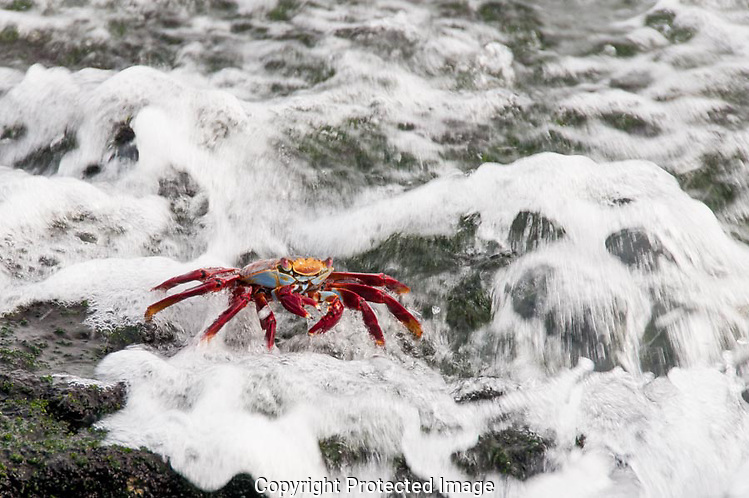 The crab in the picture above was busy grazing on algae as the wave repeatedly washed over it. It didn’t seem to be disturbed at all by the water rushing by. We saw them all over the place and they always were fascinating to watch. Their bright colors always made them jump out of the landscape. We watched a number of them picking dead skin off Marine Iguanas. Sometimes they would pinch the iguana and the iguana would try to chase them away but the crab would just move to another part of the iguana. I have loaded some additional pictures from the Galapagos on my web site (www.thomasbancroft.com) if you are interested in seeing them. In addition, I have done some updating to the site so people can order prints of pictures on the site or in the blogs. I personally print each picture. The Spring Best of Northwest 2013 Art Show is March 23 and 24th (this weekend) at the Smith Cove Cruise Terminal on Pier 91 next to the Magnolia Bridge, 2001 West Garfield St, Seattle. I will be there showing my photographs. Come on down to enjoy the artwork, food, drink, and music. I would love to chat with you.